I used maybe half a small bag of charcoal. I watched this Youtube video first. The chicken was nice but it was harder to get it cooked through when it was on the bone. Smaller pieces not on a bone got done in 4 - 6 minutes. 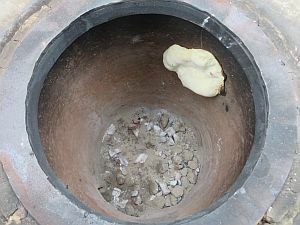 The naan bread looks like it was being done over coals, but the tandoor was very hot and lots of the coals were live under the top layer of ashes. 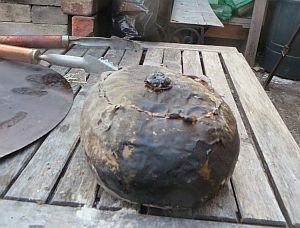 The stuffed squash went in about 2 hours after no more fire was added. Followed directions from the Pamir book, but without the mutton or sheep's tail fat -- just layered whatever I had -- cooked rice, carrots, celery, onion. 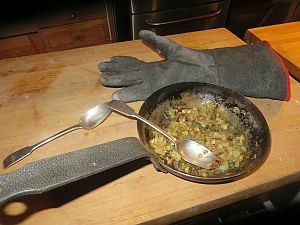 Made a paste of flour and water to stick the lid to the squash -- good thing too because it was hard to get it down onto the coals -- it slipped out of the tongs and flipped upside down onto the coals, but the flour-water glue stuck fast! stuffed squash after 90 mins. The stuffed squash was delicious but would have been even better if I had remembered to salt and pepper the layers. 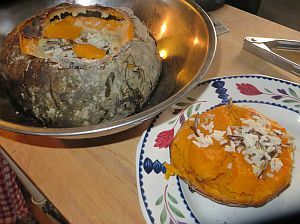 I wanted to try roasting a butternut squash whole but was unsure of the coals -- burned down to mostly ashes. 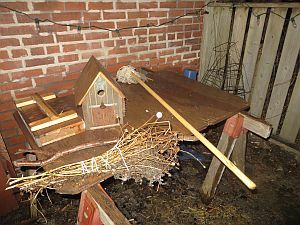 It was very quick to put in two sticks and some paper, then add 4 briquets when the fire was bright. There was plenty of heat for the squash. 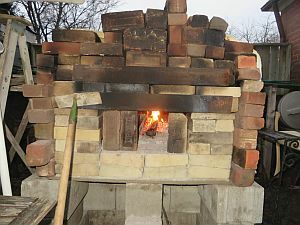 top-down fire, not bottom up, 9.30 a.m.
test: can the brick-heat cook the beans overnight? 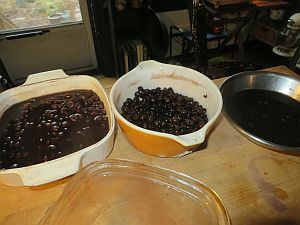 8 p.m. -- 290 F, beans in the oven. Wood use: 1 and 3/4 sack of Fiesta firewood. Lit fire at 9.30 -- much less smoke on lighting. Temp. still 90 F from last night. 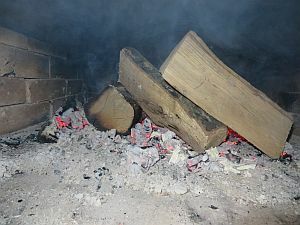 10.45 -- 3/4 of wood burned down. Added two pieces of wood. 12.30 pushed fire back. Very little smoke. Roasted lamb shanks for 10 minutes. 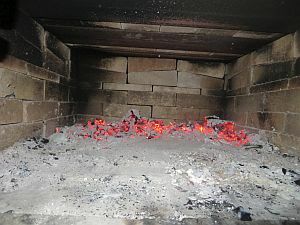 2.30 spread out coals, bricked up oven door. 3.45 took out coals. Oven temp only 300! Why? It was not very cold out, but very damp -- does that have an influence? The oven was burned mostly white, so....? 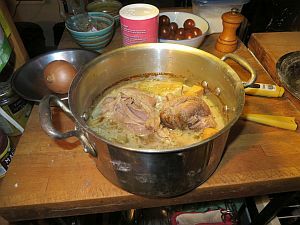 Put in simmering lamb shanks, kept them in until 10 pm. 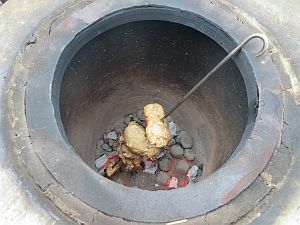 Oven still at 200 F then, shanks at 142 F.
P.s I lit the tandoor, too, at 10.15. 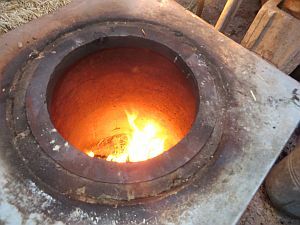 Added more coals at 11 and 11.30, and then periodically afterwards. It was hot enough to do naan bread at 3.45 and I had time, so I rolled out about a dozen and put them in two at a time -- one let go and fell in but all the rest baked as they were supposed to -- very tasty. Another rainy day, baking with the umbrella up. Fire started at 12.45. Used about 1 and 3/4 bags of firewood. 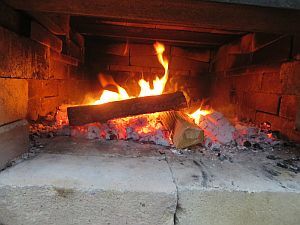 I'm getting the hang of it a bit more so there was generally less smoke than previously (also because I added wood every time the fire was getting close to coals,so the fire was strong all the way through). 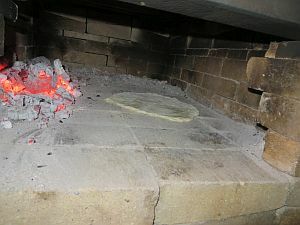 Although the oven was perfect for pizza at 6.15, less than two hours later at 8 p.m. the temperature was only 325 F. I'm wondering if the fact that the ceramic fibre blanket is wet makes the difference. 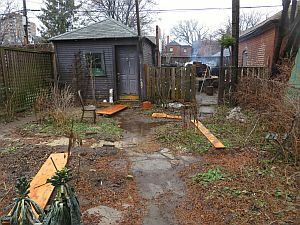 Everything is wet, even though I keep the tarp on most of the time -- no time to dry out. I put in some cut-up onions to make onion "jam" and that was done in about half an hour, even right near the oven door. 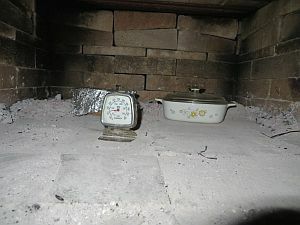 The temperature was still 325 F at 8.25, and at 10.30 it was 275 F. The next morning the bricks still felt warm. 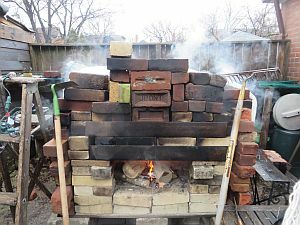 But you can't bake bread at 325 F. Maybe nothing will be resolved until it's mild enough to disassemble the oven down to the first row of bricks and fill in the cracks in the bricks with clay. 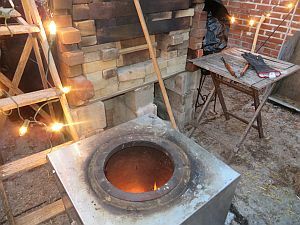 And while we're at it, maybe it makes sense to go right down to the level of the hearth and put down a layer of powered clay and some strapping so the hearth stays level. 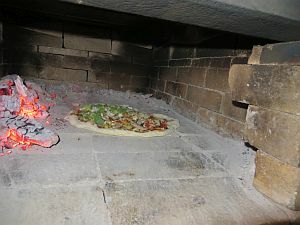 But even with a bumpy hearth, the pizza baked up fine -- it might have passed muster in Naples. I made the chicken twice more, on Jan.20 and again tonight. Both times the chicken was not fully cooked inside but a bit burned on the outside. Since I had the tikki masala sauce on the stove inside, it was easy to finished the chicken. But more work is needed! Later I put some potatoes in the coals, not wrapped. I forgot about them -- an hour later they were ashes. Lots to learn, and to remember. This visit was a real treat in many ways, but one of them was that I could spend a lot of time reading one good bread book and keep experimenting bread baking in a cozy kitchen. 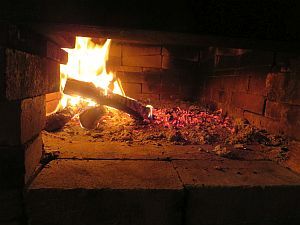 The book is “From the Wood-Fired Oven” by Richard Miscovich, and the experiment was done in the Corningware in the gas oven. I’ve baked bread since I was young but am usually lazy about making sense of why I do what I do. When to mix the dough, how much water to add, how long to leave the dough, when to check it, when to bake, etc. I rely on my hands (i.e. I don’t think or look up) or have my schedule decide the timing. This practice makes okay enough bread and I’m generally okay with it. But once in a while I talk to an experienced baker or read a good bread book and I learn that I can trust my sense with this but not that, and that I could try to make a better bread in the given environment. I learn to love learning again. No- or little-knead and pot-in-the-oven methods seem to have been “the way” in the recent homeartisan bread baking community. The dough tends to have a higher hydration and takes little mixing/kneading. It gets baked in a well-heated heavy pot with a lid. 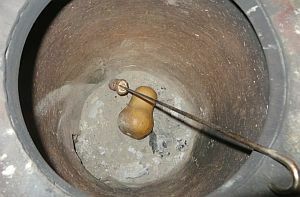 Wet dough allows the gas in it to extend it easier than dry dough. Proofed wet dough is easier to collapse than dry dough, but it springs up to the full when put in the right baking environment at the right time. The right baking environment is created with the heavy pot like cast iron ware that retains heat in itself. 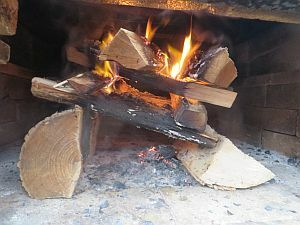 It’s like a mini wood-fired oven. With lid, it keeps the moisture from the dough and the dough needs the moisture so as to fully grow and gelatinize the starch to make the pleasant golden crust. This is probably the key to my problem with crust. 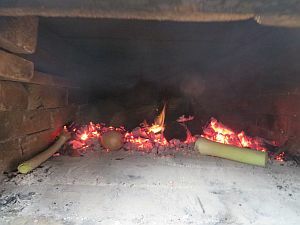 In a wood-fired oven, steam from a couple of loaves only is not enough to keep the whole oven moist for them to spring freely....is my conclusion at this point. 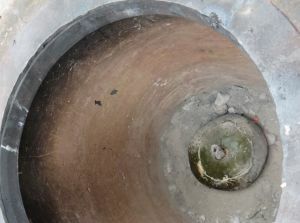 The metal bowl as a cover wouldn’t do the trick probably because it does not retain heat in itself. I knew that moisture was a big factor, but it was a lot bigger than I had thought. From now on I will have moisture as a double-star key factor on my baking practice. Flour also makes a significant difference. All-purpose flour is very kind. It’s easy to handle, becomes elastic and the elastic state is visible/sensable in the dough. Bread flour takes more water than all-purpose flour. Dough made with a high proportion of whole wheat flour is of course less elastic. My home-grown wheat flour is neither bread flour or pastry flour, but it’s noodle/dumpling flour. It makes bread packed (not dense, but tight), but has a nice sweet aroma. Rye, my favourite flour for bread aside from wheat, is a pain in the neck to deal with, but it goes very well with sourdough flavour (to me). I know as much as this and think that wheat only would keep me interested for my lifetime since there are so many varieties depending on the season, the region and the mill. Ratio of starter makes difference in rising time. 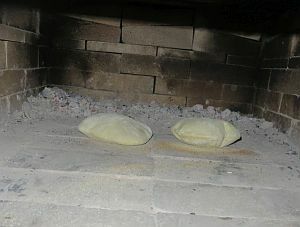 The “mother” is the regular starter consistency; Water : flour = 1 : 1. But with one of the breads I tried to bake from the book called Miche, the “mother” part had a consistency of dough. Then you add more water and less flour than more common recipe like mine, which made the final dough consistency more or less the same. It’s supposed to make a bread that is as satisfying to eat as protein like cheese. I didn’t find my miche so different from others (I probably did it wrong), but it was still an interesting recipe. Retarding brings out more of the mature sourdough flavour. I did try to bake two loaves from the same dough baked at different times —one retarded, the other not. They weren’t very different (I probably did it wrong). To me, bread seems to taste nice and mature as long as the starter is mature. I like retarding because it makes home baking even more relaxed. If some unexpected plan comes up, I can put the dough in bed (fridge) and go out. If it makes better tasting bread, it’s great. But I love retarding more for it’s forgivingness.